In September 2014 board member Alys Campaigne went to Washington DC to meet with members of the South Carolina Congressional Delegation and the Department of the Interior to press for funding and support for Lowcountry public lands. Ms. Campaigne visited the offices of Senators Graham and Scott and Congressmen Clyburn and Sanford, seeking support for federal operations and maintenance and land acquisition funding for projects on our refuges and forests. 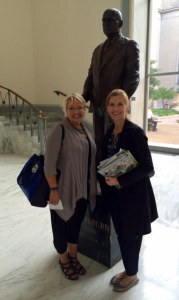 Friends of Coastal South Carolina board member Alys Campaigne (right) with National Wildlife Refuge Association Vice-President of Government Affairs Desiree Sorenson-Groves (left) in Washington, DC. 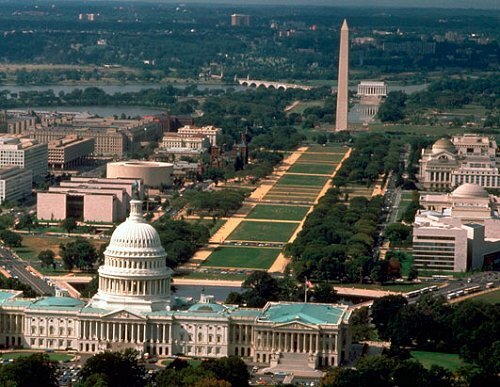 In September 2014 board member Alys Campaigne went to Washington DC to meet with members of the South Carolina Congressional Delegation and the Department of the Interior to press for funding and support for Lowcountry public lands. Ms. Campaigne visited the offices of Senators Graham and Scott and Congressmen Clyburn and Sanford, seeking support for federal operations and maintenance and land acquisition funding for projects on our refuges and forests. Recent federal budget cuts have led to the elimination of park ranger and law enforcement positions on the refuges, limiting some access and enjoyment of these publicly owned areas. With over 380,000 acres of protected lands, and millions in contributions from private businesses and individuals, our Refuge and Forest Service partners have demonstrated an outstanding ability of delivering tremendous value for modest federal investments. A recent study shows that every $1 invested in the Refuge System delivers $4.87 in economic returns to local economies. The fact that “Our coastal protected areas are under tremendous pressure from development, sea level rise, and coastal erosion. Federal investments in our refuges and national forest leverage tremendous private sector commitments that benefit our region’s wildlife, public health and economy,” was a key part of the message Alys delivered. Take Action: your voice needs to be heard in the process of developing a new management plan for the Francis Marion National Forest.